Wooden Pound and Tap Bench brings together two favourite toys into one. A ball hammering bench and a xylophone. The ball hammer bench has three balls which can be pounded through 3 holes with a wooden mallet. The balls are held in place by a rubber ring insert so there is just the right amount of resistance as the balls are hammered through. 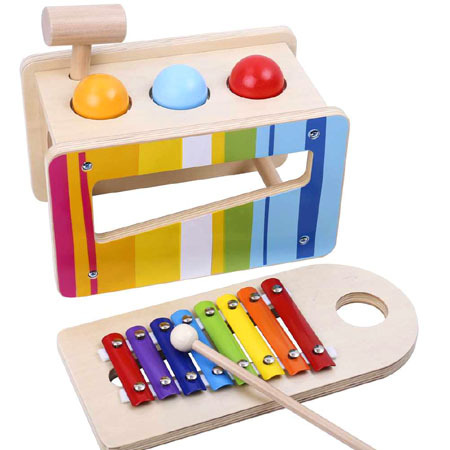 The xylophone has 8 metal keys and a wooden striker and is beautifully coloured. A wonderful combination toy which teaches the difference between pounding and tapping and the amount of force needed for each toy. The xylophone slots neatly into the hammer bench at an angle. So you can even hit the balls through the bench and listen to the musical scale as the ball rolls down and out. We like this because: "Great combination toy and beautifully presented"